These earrings are simple but beautiful, this is an item that I will definitely add to my wish list! For such a small item there's a lot of detail on the mane and tail. The width of the earrings is 7/8 inch. The height is 3/4 inch. If they were a full circle they'd be about as big as a quarter. They look delicate, but they're sturdy. 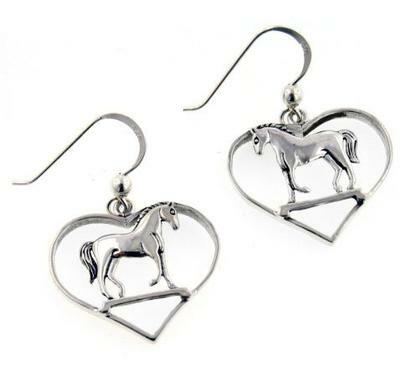 These earrings have a heart shaped frame around a graceful posing horse. Crafted of sterling silver with hooks for pierced ears. Those are the prettiest earrings I have ever seen. Probably because they're horse earrings! i can't wait till i give this to my friend for CHristmas! they are soooooooo cute! i might have to get a pair for myself! I don't have my ears pierce yet and I've been looking for years for pretty horse earrings to wear and those are sooooo on my wish list. Return to Share Your Favorite Horse Jewelry!.